Flexi bits are made from a polyurethane material, meaning they are light and flexible. Soft to the horse's mouth, they are suitable for young sensitive horses, recently backed horses and horses uncomfortable in a conventional steel bit. This bit applies pressure to the poll and roof of the horse's mouth in a number of ways. The joint creates the nutcracker effect, whilst the centre of the joint can shoot out for additional pressure. The rings are made from stainless steel to prevent rusting and improve durability. The 4 ring bit should be used with two reins; one on the main snaffle ring, with the other on either of the two lower, smaller rings, depending on the required poll pressure. 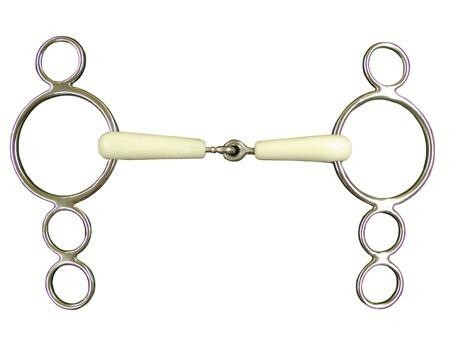 There are currently no questions for JHL Flexi Continental 4 Ring Jointed Snaffle - be the first to ask one!